These are the tools that are used on an ongoing basis, unlike the Site building tools that are generally used only when setting up a Drupal site. Users of our web site can post comments on pages besides other content. The Comments section is a convenient place for administrators to see an overview of comments on the site and to moderate them. Comments are either published or unpublished; comments which are published are displayed on the web site, where as unpublished comments are visible only to users with administrative permissions. We will look at the last two of these reasons later on in this book, when we look into users and permissions in more detail. However, manually setting the published status can be done from the comments section here along with various other tasks. The context-sensitive menu (that is, the tabs, as they are generally referred to, although with the Garland theme, they don't appear very tab-like) on this page (next to the Comments heading) allows us to toggle between approved comments (Published comments) and those pending approval (Approval queue). Typically the purpose of unpublished comments (those within the Approval queue) is to review them and then decide if they are suitable to be displayed on the web site (in which case we would approve them) or not, and if they are not, we would then delete them. Below is a list of the latest comments posted to your site. Click on a subject to see the comment, the author's name to edit the author's user information, 'edit' to modify the text, and 'delete' to remove their submission. The drop-down list of Update options allows us to publish or unpublish comments, and also delete them. Comments can be edited by clicking the edit link in the operations column. — By pressing and holding the Shift key, checking a box, and then checking the last box in the range you wish to select, you can select a large range of checkboxes easily. Comments which we looked at earlier were attached to a particular piece of content such as a forum post, blog entry or a page. 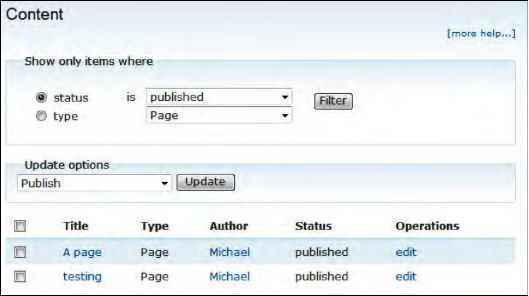 This content can be managed from the Content area of the Drupal administration section. We only have two options for the types of content available at this time, and they are Page and Story. More will become available as we enable more features and install more modules. Besides published or unpublished, there are several other possibilities for the content status. There is a handy filter option available which allows us to specify the types of content or the content of the status that we wish to display. This filtering is done via the Show only items where section. We looked at these in detail earlier in this chapter. They include: published or not published, promoted to the front page or not promoted, sticky or not sticky. We may also be able to perform more actions, as other modules can add new actions to that list. Content within Drupal is classified into various types (nodes), which can be managed, and new types can be created. Various modules also introduce their own content types (for example, Drupal's e-Commerce modules introduce content types such as products). This section lists the Content types available, allows us to edit and delete the Content types and allows us to add new Content types. Below is a [ist of ail the content types on your site. 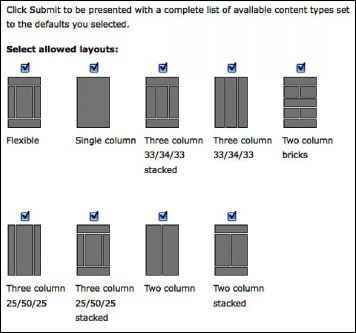 All posts that exist on your site are instances of one of these content types. A story, simitar inform to a page, is ideal for creating and displaying content that informs or engages website visitors. Press releases, site announcements, and Story story informal blog-like entries may ail be created with a story entry. By default, a story edit delete entry is automatically featured on the site's initial home page, and provides the ability to post comments. Initially, we only have options for Page and Story content, both of which are very similar in purpose but (by default) have some slight differences including the ability to post comments, or for the content to be promoted to the home page of our site (referred to as the front page within Drupal). We don't need to create or edit a content type yet, both of which involve a large number of options and settings, so let's leave that for now and return to it when we need to. Because some pages, such as the home page, can have a number of different stories posted on them, we have some settings available to help manage this. Must users preview posts berore submitting? The Number of posts on main page setting limits the number of posts displayed on the page, the Length of the trimmed post setting allows us to set how much of a post is displayed on the page. If we were to display 10 posts on a page, each of which was a few thousand words long, we would have a problem! The default settings are ideal; they display a range of posts, but only provide a snippet of information (accompanied with a link to the post in full of course!). Finally, we have the Preview post setting. When a post is created, the user has the option of previewing the post before submitting it. This allows the users to check if it displays correctly, and review it before submitting it. Here, we can decide if users should preview their posts or if the preview feature is just an optional extra for them to use. If preview is required, the submit button isn't shown until the submission has been previewed. By default, Drupal sites produce their own RSS feeds, the most important one is the feed of the front page content, which is available at http://localhost/drupal-6.2/rss.xml. There are two simple settings available for the publishing of RSS feeds by Drupal. RSS stands for Really Simple Syndication. One of its particular uses is to allow visitors to read blogs, posts, news items and so on, from their favorite web sites at their convenience, all in one place with a news reader application. One example of such an aggregation of lots of feeds is www.drupal.org/planet. Here, Drupal-related news from various sources is aggregated in one place using the RSS feeds from the various web site sources. For more information on RSS, Wikipedia has an extensive article : http://en.wikipedia.org/wiki/Rss. Default number of items to include in each feed. These settings are similar in nature to the Post settings; the Number of items in each feed setting defines how many items should be included in the feed, and the Feed content setting defines what information about the post should be contained in the feed such as just the title, the title and the teaser text or the entire content. If we were to select Full text, then we may find entire articles and resources published on our site, appearing on other sites. This obviously deters new users from our site as our content would be widely available. By keeping this set to Titles plus teaser, the reader will need to follow the link back to our site to read the rest of the content, even if our content is aggregated onto other sites. The Taxonomy module within Drupal provides features to categorize and organize content using tags and terms we (as administrators) set. The taxonomy module allows you to categorize /our content using both tags and administrator defined terms. It is a flexible tool for classifying content with many advanced features. To begin, create a 'Vocabulary' to hold one set of terms or tags. You can create one free-tagging vocabulary for everything, or separate controlled vocabularies to define the various properties of your content, for example 'Countries' or 'Colors'. Use the list below to confrgure and review the vocabularies defined on your site, or to list and manage the terms (tags) they contain. A vocabulary may [optionally] betted to specific content types as shown in the Type column and, if so, will be displayed when creating or editing posts of that type. Multiple vocabularies tied to the same content type will be displayed in the order shown below. To change the order of a vocabulary, grab a drag-and-drop handle under the Name column and drag it to a new location in the list. [Grab a handle by clicking and holding the mouse while hovering over a handle icon.] Remember that your changes will not be saved until you click the Save button at the bottom of the page. Users of our web site, provided they have the permission, can enter their own "tags" to categorize their content, or select from a list of tags which we have specified. The Drupal project web site has Taxonomy set so that you can categorize your post with regards to a specific version of Drupal. This has quite a number of applications and uses with regards to our site, which we will come to a little later in this chapter. Taxonomy consists of terms (or tags) grouped into vocabularies. Vocabularies are created via the Add vocabulary link in the context sensitive menu, where we can define the name and description of the group of terms, set which content types can use it, and specify how it should work.